Powder Mountain is one of the best areas in Utah to snowkite because of its high elevation, exposure to wind, and suitable riding areas as shown in the pictures to the right. 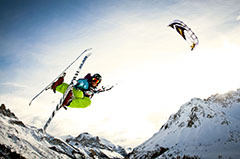 Utah Kite Addiction conducts Level 1 and 2 snowkiting lessons here. 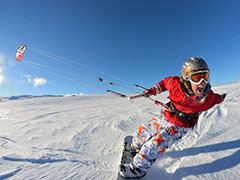 Olympic snowboarder and World Champion snowkiter, Chasta, is shown below ripping Powder Mountain. Look for winds out of the south, southwest, and west for the best riding. South winds allow you to ride back and forth from the Hidden Lake Parking lot to the Towers (main riding area). A west wind allows you to get out to the Towers, but it is difficult to kite back. Chasta shown below searches for a route through the trees while exploring at Powder Mountain. Pineview Reservoir is probably the best place in Utah to hone in your kiting skills once the lake has frozen over. Light and consistent winds from 5 to 12 mph travel from Ogden Valley over the spillway just about every morning after cold clear nights and during times of inversions. Park across from the dam keepers house and walk down to the ice. 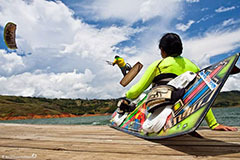 The wind changes direction in the afternoon often producing faster wind speeds opening up the riding area near Windsurfer Beach. Watch for pre and post frontal winds that blow across the entire lake for epic lake cruising. Shown below, Auggie and Marty enjoying a morning session. Drive up Highway 39, about 30 miles east of Ogden, to where the winter road closure is. 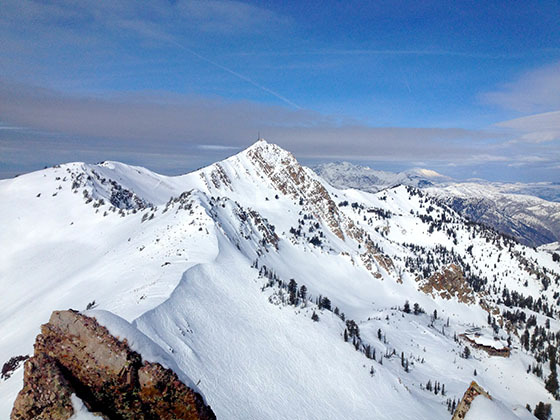 Ski, hike, or snowmobile 1/4 mile or more north along Ant Flats road to the open bowls. Look for strong North and South pre and post frontal winds, and this place will come alive. 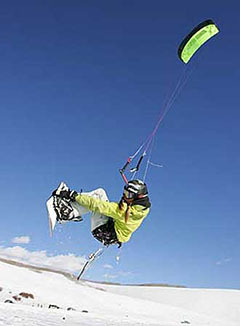 Skyline Drive is arguably the best and most popular place in Utah to snowkite. From Salt Lake City, travel Southbound on I-15. Take Exit 261 onto US-6 Eastbound and drive approximately 14 miles. Turn right onto US-89 Southbound and continue about 29 miles. At Fairview, bear left on the "Y-intersection", taking Highway 31 up into the mountains. Stay on highway 31 until you drive above the timber line. Look for Mile Marker 14. From Salt Lake City, take Interstate 80 east out of Salt Lake. Drive for approx. 23 miles to exit 148. Continue southbound on US-40 toward Heber City. Continue past Heber on US-40 southbound to strawberry Reservoir.